For those who have to do legal research you may be familiar with Lexis Advance, previously known as Lexis Nexis. Legal research can be a daunting prospect but Lexis Advance’s new design has lots of handy little tricks that can give you a leg up on your legal research. 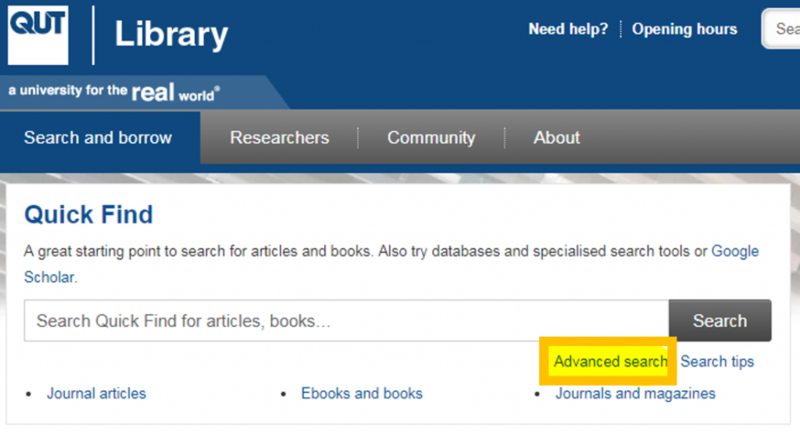 Here are our Law Librarians top tips for getting started with Lexis Advance. Advanced Search – This is where all the old search forms from Lexis Nexis have gone including Cases and Legislation. These advanced search forms allow you make your search more specific. For example you can search for cases related to a provision of legislation or for legislation that contains a defined term. Analytical Materials – This is what all secondary sources in Lexis Advanced are called and this includes dictionaries, encyclopaedias, journal articles and commentaries. Use the Advanced Search form for Analytical Material to search throughout all secondary sources. Or locate the full list of Analytical Materials for Australia by selecting the Browse button at the top of the screen > Publications > Australia > By Content Type > AU Analytical Materials. Search Everything – This button is located next to the main, red search box and is very powerful! If you click on it options appear for narrowing your search. This includes jurisdictions and content such as cases, legislation, analytical materials and forms and precedents. You can also narrow by legal topics and any recent publication or searches you have looked at. Favourites – Add your most used searches or publications to your favourites box so you can easily access them. This is one of the best parts about Lexis Advance! You can do this by clicking the star next to the publication title either when in the publication itself or by looking at the Recent & Favourites tab under the Search Everything button. Once the star is yellow it’s a favourite, yay! And you can access it from the home page of Lexis Advance. For more assistance with legal research pop into the Gardens Point Law Library on Level 5 of C Block or contact us! Numbered referencing can be one tough cookie to crack. One particular question we get asked a lot is how to reference an image taken from the internet using QUT Numbered referencing. Have no fear! We have consulted the experts and this is the template we recommend. Don’t have all of these pieces of information for your image? Here are some handy hints on how to navigate this. No date? Replace this section with [date unknown]. No title? Write a brief description of the image in square brackets and put this where the title would be. Of course this only makes sense with some examples. Have a look at these to get more of an idea of what your numbered reference should look like for an image. Quality is key to selecting the right journal to publish in and avoiding predatory publisher traps can be difficult. In response to the problems of deceptive journals and conferences, a collection of publishers, publishing ethics groups, open access groups and academic libraries created Think Check Submit. The campaign helps researchers identify trusted journals for their research via a simple checklist to assess the credentials of a journal or publisher. – Have you read any articles in the journal before? – Is it easy to discover the latest papers in the journal? Think Check Submit is now available in seventeen languages including Arabic, Chinese, Indonesian, Spanish and Thai. Want to know more about how to choose journals to publish in? Contact your Liaison Librarian and check out the Which journal? advice from QUT Library. Did you know that QUT Library’s Quickfind searches over 80% of all the resources available at QUT? If you are looking for a book, journal article, report or newspaper article this is a great first place to look! Quickfind’s Advanced Search can help you find information you need efficiently. You can find the Advanced Search underneath the Quickfind Search Bar. Once you are in the Advance Search screen type your keywords into the search boxes. To search efficiently, put each concept or keyword on a different line and choose the right Search Operators to separate the lines. After you’ve entered your keywords you can refine your results further by selecting certain publication years to look at or by choosing the content type you want to focus on, such as articles or books. Advanced Search also allows you to select peer reviewed sources as another option to refine your results. By refining your search using the Advanced Search you will save time and get to relevant results faster, woo! Speak the database’s language. Figure out your keywords and synonyms first and how link them with search operators used by the database so it can understand exactly what you are looking for. Look for ‘search tips’ or ‘help’ buttons within the database to identify your database’s preferred search operators. Don’t be afraid to change your search strategy. Look in your results for other keywords or synonyms you can use and try different keywords and combinations. Try new things. Change the field you are searching in. If you are getting too many results from searching All Fields, try searching for your keywords just within the abstract, or look for a particular author. Contact your information experts for more assistance with using Quickfind’s Advanced Search.